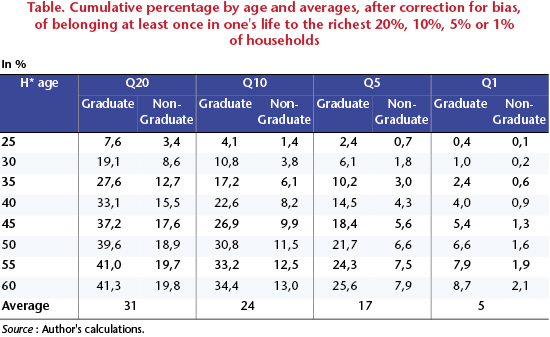 According to this study, during their working lives (age 25 to 60), 69.8% of Americans have enjoyed at least one year of household income sufficient to be included among the richest 20%. And 53.1% of Americans have made it – for at least one year – into the richest 10%. An even more exclusive 11.1% of Americans have spent at least one year in the illustrious club of the wealthiest 1%. But before accepting these outlandish figures, a more serious look needs to be taken of the study by Hirschl and Rank. It turns out that the numbers do not in fact offer a simple description of American society, but are rather the result of a modelling exercise. Behind these figures lie certain assumptions and methods that have been adopted, and which deserve discussion. In the latest Note de l’OFCE (no. 56 of 12 January 2015), I show that the assumptions made are unrealistic and that the method used does not support the presence of missing data in the biography of the respondents. All in all, the results are heavily biased in favour of the American dream. It is possible, however, to partially correct this bias, yielding the results in the table below. Basically, the Hirschl & Rank figures are cut in half! Thus, 31% of Americans will have a sufficient household income for at least one year (between age 25 and 60) to be among the richest 20%. And 5% of Americans will have a sufficient household income for one year to be in the richest 1%. Given the magnitude of this correction, it is clear that the study by Hirschl and Rank distorts reality by suggesting that social destinies in the United States are very chaotic – as if the entire society were at the roulette table. Other articles by Hirschl and Rank further fill out the picture. It is not in fact the first time that these authors have come up with such figures using this method. In 2001, they examined the other end of the income distribution, evaluating the percentage of Americans who have experienced an episode of poverty during their lifetime (Hirschl and Rank, 2001). They again came up with striking figures. For example, 54% of Americans experienced an episode of poverty  before age 40. In 2005, they again applied this method to recipients of food stamps (food vouchers), and estimated that 50% of Americans will have made use of food stamps at least once in their lives (before age 65). This order of magnitude is, yet again, barely credible. A less costly and more direct method would certainly be revealing: it would suffice to ask Americans whether they have ever received food stamps. While some Americans may prefer to hide such an event, this bias of omission will never be as large as that of the preceding survival analyses. Let’s be clear: their method is a machine for producing the outlandish. The poverty threshold adopted here is 1.5 times the value of the basket of goods needed to meet basic needs. ← What strategy for internally rebalancing the euro zone?